Apollo’s Hegemony Agmatine is a dietary supplement containing 500 mg of agmatine sulphate per capsule. The preparation improves blood flow in muscles and enhances their regeneration, helps to restore sensitivity to stimulants, and has a beneficial effect on the efficiency of the nervous system (nootropic, neuroprotective, and antidepressant properties). Agmatine is a polyamine, an L-arginine metabolite formed as a result of decarboxylation. Agmatine occurs commonly in many food products but its content in food is much lower than standard doses with biological activity, which is why it is becoming a more and more common component of dietary supplements, where it is found in the form of agmatine sulphate. The most popular application of agmatine is stimulating the phenomenon of the so-called muscle pump, because of which it enjoys great popularity among physically active people. However, agmatine exhibits a much wider range of activity, it goes far beyond just stimulating nitric oxide. For a relatively short time, agmatine has been named one of endogenous neuromodulators or neurotransmitters, believed to have a significant role in supporting the treatment of many central nervous system (CNS) disorders. Thanks to its neuromodulatory and neuroprotective properties, agmatine can prove of great help in case of such ailments as depression, anxiety disorders, morphine addiction, Parkinson’s disease, epilepsy, or brain trauma. According to scientific research, agmatine can prove a promising agent in terms of alleviating neuropathic pain (it works in synergy with some analgesics, such as morphine – it is able to stimulate anxiolytic activity), supporting drug addiction treatment, preventing strokes, and supporting cognitive functions. Agmatine works in synergy with many antidepressants as well, for example bupropion. Agmatine is stored in nerve cells, and then, as a result of their activation, it is released. To define the location of agmatine more exactly, it is present mainly in the areas involved in regulating anxiety, stress and depression. It has been observed that aginine decarboxylase, the enzyme that allows the production of agmatine, increases in stressful conditions. It is believed that the process is the organism’s defensive response to stress. Many scientific studies demonstrate that agmatine exhibits nootropic properties and is involved in learning and remembering processes. It has been shown that after oral administration, agmatine affects cognitive functions, which, in turn, suggests that it can cross the blood-brain barrier and reach the brain. Moreover, the half-life of agmatine in the circulatory system is much shorter than its half-life in the brain itself. Agmatine also shows the ability to prevent excitotoxicity caused by glutamate and excessive NMDA receptor activation. Excitotoxicity is a pathological process involved in many disorders in the organism, for example: brain strokes, neurodegenerative diseases (multiple sclerosis, Alzheimer’s or Parkinson’s disease), hypoglycaemia. Using agmatine can not only slow down the development of tolerance to analgesics and reduce drug or alcohol addiction. As it turns out, the substance can also prove of great help in case of growing resistance to stimulants. Thanks to its ability to antagonise NMDA receptors of the glutamatergic system, agmatine helps to increase the level of neurotransmitters (like catecholamines – noradrenaline and dopamine), whose reserves drop as a result of excessive excitability connected with regular supplementation with some stimulants, for example caffeine, DMAA, PEA. Agmatine slows down the development of tolerance to psychoactive substances, improves the regeneration of dopamine receptors, and helps to get through the difficult period of stimulant withdrawal. By helping to increase nitric oxide synthesis, agmatine dilates blood vessels and improves blood flow in muscles, thanks to which it increases exercise capacity and endurance. The probable mechanism of that activity is connected with the fact that agmatine affects vascular endothelial cells. By permeating through blood vessels, agmatine molecules bind with receptors found in the membranes of vascular endothelium, in response to which cells produce nitric oxide. 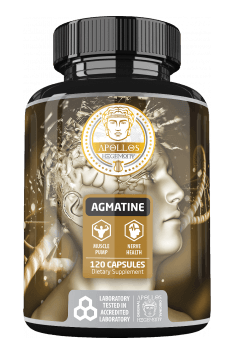 To sum up, Apollo’s Hegemony Agmatine is a dietary supplement that, apart from its beneficial effect on exercise and regeneration capacities of the organism, also exhibits great potential in terms of treating neurological and neurodegenerative diseases. The preparation is designed not only for physically active people who wish to increase their nitric oxide synthesis, but also for those who struggle with increasing tolerance to stimulants or need support in the difficult period of stimulant withdrawal. 1 gram tej agmantyny (2 tabsy dla mnie gdyż jestem 100+ kg wieprzek) - rewelacja. Takiej pompy nie doznałem nigdy. Ćwieczę rano, na czczo poza amino, o 6.30. 2 kapsy tego + amino... ROZWALA. Cudo! Pompuje jak nie wiem!!!!!!!!!!! Take 1-2 capsules daily with a meal, 30-45 minutes before training. It is a good idea to take agmatine about 30 minutes before training, as that will allow an increase in nitric oxide levels in blood vessels and, therefore, a better muscle pump. An additional advantage of agmatine supplementation before workout is the fact that it can help to reduce tolerance to stimulants contained in, for example, pre-workout supplements. In order to increase the effect of the restoration of sensitivity to stimulants, it can prove useful to combine agmatine with huperzine A supplementation, as the substance can improve the desired effect as a non-invasive NMDA inhibitor.